What post processor do I use for Vectric programs (Aspire, VCarve, Cut 2d, Cut 3D, PhotoVCarve)? G-Code is the generic name for CNC machine control language. It is the way that you can tell a computerized machine (CNC machine) to make something. 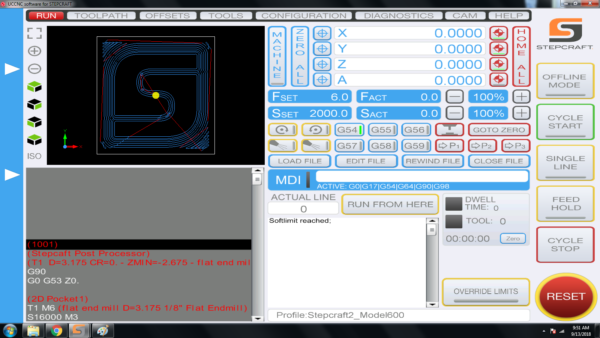 G-Code consists of instructions that tell the CNC machine where to move, how fast to move and what path to follow. As the machine is following the G-Code, it is continually removing material (except in the case of a 3D printer, where it is adding material) leaving behind a finished part. You do not need to know how to program G-Code to run many of today’s personal desktop CNC machines. STEPCRAFT recommends using CAD/CAM software like Fusion 360, Vectric VCarve, Cut 2D or Cut 3D or Deskproto. These programs have an intuitive graphical interface that allows you to set all of the parameters for your job and then the software will output a fully-formatted G-Code file that you can load into your CNC’s machine control program to run the job. It is, however, not a bad idea to learn the basics of G-Code so if there was ever a problem with a job, you can quickly reference the code and see and understand what the machine is doing (or supposed to do) for the given G-Code commands. I want to buy a STEPCRAFT Complete System package, but I want VCarve Pro rather than Desktop, how can I do this? All of the complete system packages, with the exception of the ELITE comes with Vectric VCarve Desktop software which will have a 24×24″ size limitation. If you are looking to order the 840 CNC, then you will NOT be able to use the entire work bed with a single file using VCarve Desktop. So you would need to VCarve Pro. You can click this link https://stepcraft.us/product/package-upgrade-to-v-carve-pro/ to add the “UPGRADE” to your order. Please NOTE that this is ONLY the upgrade and can only be used in conjunction with a complete system that has VCarve Desktop. How do I upgrade from VCarve Desktop to VCarve Pro? 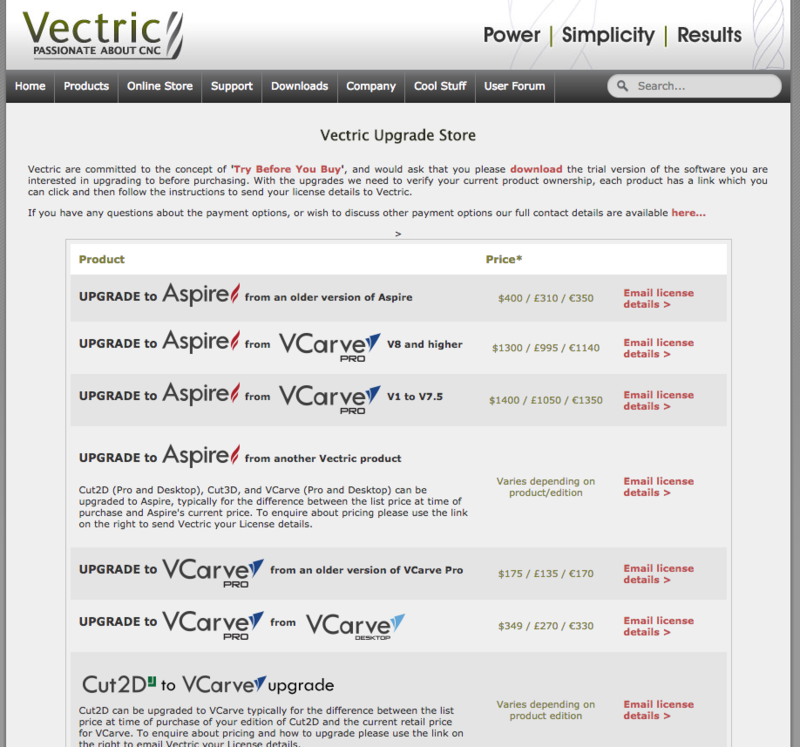 You can go to Vectric’s website http://www.vectric.com/store/upgrades.html. There you will be given the pricing for upgrading your version of VCarve. Do I have to design my files in metric because I see that UCCNC is metric? No, You can design in inches or metric. If you are using Vectric programs, you can design in inches or metric because when you choose the post processor to create your file, the post processor will convert the G Code to metric. Can you send me the Vectric software while I am waiting for my machine to arrive so I can start to learn it? While we could do this, there will be an additional shipping charge to do so. And if you live outside the USA, there will be customs and duties fees also associated with this. If you wish to learn the Vectric software while you are waiting for your STEPCRAFT CNC to arrive, your best bet is to download a FREE full working trial copy of the software from Vectric’s website. The trial versions will not allow you to save a toolpath for your CNC other than the special sample files that are included. 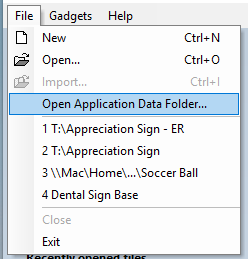 However any files that are created and saved with the trial versions of Cut2D, VCarve Pro, Aspire or Cut3D can be opened and made fully operational once you purchase and install the full version of the software as long as it is installed on the same PC as the trial version software. Important: Please note that the Trial version of the software cannot be ‘Activated’ with the license key you receive when you purchase a copy. The trial versions of the software are for testing and evaluation only. It is not possible to license them to become full versions. You will however be supplied with a CD with your order which you can install and overwrite the trial copy. Can I test out the Vectric Software before I buy it? Can I engrave a photograph into a piece of wood? Yes, you can use Vectric’s PhotoVCarve program, which allows you to create an engraving tool path for photos. Additionally, you can use the new Laser Engraving Head DL445 which can laser engrave your photos into a variety of materials.